Customize the squares with names, birth years, and icons that represent their hobbies or traits. 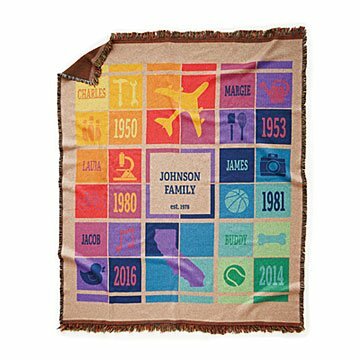 For the family that's beyond proud of what they've built, this woven keepsake blanket celebrates every "building block" and what makes each of them one-of-a-kind. Customize the printed squares with names, birth years, and two icons that represent their hobbies or traits. Together, they create a colorful modern tapestry that's cozy enough to keep on the couch and attractive enough to hang on the wall, making it a tug-at-the-heartstrings kind of gift for grandparents and new parents alike. Woven in North Carolina. Printed in Alpharetta, Georgia. See the customization instructions and list of available icons. Check out the Fabric of Our Family Blanket - Americana here and the Fabric of Our Family Building Blocks Art here. Machine wash gentle in warm water. Tumble dry low, gentle cycle. Do not wash with bleach or iron. Its beautiful and perfect for my mom who misses all of her children dearly. She and my dad now sleep with this blanket on their bed at night. Its so incredibly sweet. This is awesome for my parents. Now that the kids are growing up and out, this is a fine way for everyone to remember everybody. This was a great gift for my parents; they will watch television with my younger siblings at the end of the day, and use blankets to keep warm/cuddle. While this blanket was more tough, it is perfect when paired with a fluffy blanket underneath. Its' weight keeps the user warm, if not texture. The colors and printed designs were great, no leaking over or spilling into different segments. I only wish it was a foot longer so that it could be used by taller individuals - my family is all pretty tall, my brothers are all at or past six feet. What an amazing gift. The recipient loved it! Functional and enjoyable! I bought this a Christmas gift for my mother. When I unpackaged it, I was blown away at the design. A really amazing idea! However, there were already a few strings unraveling, it wasn't very cozy AT ALL, and was technically smaller than given dimensions. While I'm probably just being crabby, I'm genuinely upset that it's not the perfect blanket I imagined. It'd be great as a wall tapestry, but I intended it for a cozy blanket. We have many dogs, and I'm worried about the daily wear-and-tear. The stings don't seem to be anchored at all? My dog's collar could snag one and unravel it immedtely. I'm a broke college student and I splurged on this. While I think it's great quality, definitely not a $145 blanket. Maybe a $145 wall tapestry. Bottom line is: this product looks great. It's a sweet idea. It should be advertised a tapestry, NOT a blanket. This product can be used as decoration or in everyday use! My daughter has it so I don't know how often she uses it .Or how pleased she was with it. Since it was a gift I don't use it, but it always looks great on my friends couch when I visit. I'm happy my mom can display information about all her kids in one small parcel. She doesn't have room for photographs of everyone and their families. The blanket looks beautiful on our couch in the family room and comes in handy on cold nights!